My A string is wolfy no matter where I play it. 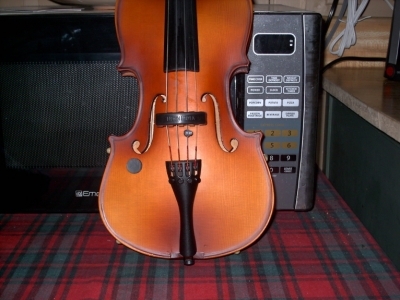 I have a Cecilio CV300 with Zyex strings. I've had it since Xmas. I don't remember if the steel strings did this. What can I do about this? Wolf eliminator? I put a lead fishing weight on the A string between the tailpiece and bridge, and I can't decide if it helps. I also moved the post closer to the bridge foot. My wife says it sounds better, but that A string is barf city. Is it the fiddle, string, bow, or what? I also think the fit of the bridge to the top could be better, and I have the little wheeled tool for that. Some people glue weights on the inside. I haven't been able to find info on this though. I moved the fishing weight 1/2 in from the bridge and I *think* that helps. Oh and I just cleaned the rosin cake off the strings with alcohol (damn ice cubes get in the way) and put a pair of magnets below the bass f hole. I *think* that helps so far. Second position was impossible to play without doing something, as if I can play second position anyway lol. I thought it was the Zyex strings..I don't want anybody to think they are bad...they are all right. I just hadn't noticed a problem until I'd changed the strings, so naturally I thought they were the culprit. When this set is worn out I'm going to try a set of Red Labels I have just to mix things up a bit. I suspect another problem is the tailpiece. I know on a Stratocaster, the bridge block must be steel, an aluminum (I made one) bridge block will give you wolfs all over the guitar. Pot metal/zinc is also really bad. This fiddle has I believe an aluminum or Al/zinc alloy tailpiece. So, it *might* contribute. I have an ebony tailpiece for it, will put it on sooner or later. A quick Google search told me a wolf can be helped by adding material below the bass f hole. Eventually Ima take the top off this thing because that's the kind of guy I am, and put a patch/cleat in it if I deem it will help. The good thing about a low cost fiddle is you have to noodle with it in order to learn how the thing works, mechanically speaking. So also the maple pegs will be replaced with ebony, which I have. Also the fingerboard will be replaced; I have that part too. First I think I'll scoop this FB for practice; it is straight. Gotta straighten my bow with an alcohol lamp which I have. Oh and I want to do a Jack Fry regraduation to the top to see if I can get it to sound really good for a clunker. What I'm looking for is a Baroque/chamber music warmish sound. Of course the neck angle is too steep but I'm will leave that alone. By the time all this is done to it, it should be just about destroyed, hopefully. See where the magnet is placed this is the most common place for a wolf tone. I would suspect that the steel strings could not vibrate properly to create the wolf tone so when you put on the zyex the tone appeared due to a better string not due the the string being bad. well yeah this is a pretty cheap violin and anything can happen. My wife and I both noticed that with the Zyex strings, this thing sounded like hell compared to the factory steel strings esp when they were new. It sounds somewhat better now that they are broken in, but in a lot of ways still not as good as our Cecilio CV500 that still has the factory strings on it. It may be that this particluar fiddle wouldn't sound good with any brand of nylon strings. There's a youtube vid where Alison the Online Violin Tutor (damn she's a nice looking lady too esp in profile) says she doesn't think this model would sound better with other than steel strings on it. She's probably right, but how does she know? Would all cheap fiddles sound better with steel strings? My other burning question is, how do they build a cheap fiddle that sounds a little bit better than the next lower model cheap fiddle? Do they do some graduations and not others?